Music education is a field of study associated with the teaching and learning of music. It touches on all learning domains, including the psychomotor domain (the development of skills), the cognitive domain (the acquisition of knowledge), and, in particular and significant ways, the affective domain (the learner's willingness to receive, internalize, and share what is learned), including music appreciation and sensitivity. Music training from preschool through post-secondary education is common in most nations because involvement with music is considered a fundamental component of human culture and behavior. Cultures from around the world have different approaches to music education, largely due to the varying histories and politics. Studies show that teaching music from other cultures can help students perceive unfamiliar sounds more comfortably, and they also show that musical preference is related to the language spoken by the listener and the other sounds they are exposed to within their own culture. During the 20th century, many distinctive approaches were developed or further refined for the teaching of music, some of which have had widespread impact. The Dalcroze method (eurhythmics) was developed in the early 20th century by Swiss musician and educator Émile Jaques-Dalcroze. The Kodály Method emphasizes the benefits of physical instruction and response to music. The Orff Schulwerk approach to music education leads students to develop their music abilities in a way that parallels the development of western music. The Suzuki method creates the same environment for learning music that a person has for learning their native language. Gordon Music Learning Theory provides the music teacher with a method for teaching musicianship through audiation, Gordon's term for hearing music in the mind with understanding. Conversational Solfège immerses students in the musical literature of their own culture, in this case American. The Carabo-Cone Method involves using props, costumes, and toys for children to learn basic musical concepts of staff, note duration, and the piano keyboard. The concrete environment of the specially planned classroom allows the child to learn the fundamentals of music by exploring through touch. Popular music pedagogy is the systematic teaching and learning of rock music and other forms of popular music both inside and outside formal classroom settings. Some have suggested that certain musical activities can help to improve breath, body and voice control of a child. The MMCP (Manhattanville Music Curriculum Project) aims to shape attitudes, helping students see music not as static content to be mastered, but as personal, current, and evolving. In primary schools in European countries, children often learn to play instruments such as keyboards or recorders, sing in small choirs, and learn about the elements of music and history of music. In countries such as India, the harmonium is used in schools, but instruments like keyboards and violin are also common. Students are normally taught basics of Indian Raga music. In primary and secondary schools, students may often have the opportunity to perform in some type of musical ensemble, such as a choir, orchestra, or school band: concert band, marching band, or jazz band. In some secondary schools, additional music classes may also be available. In junior high school or its equivalent, music usually continues to be a required part of the curriculum. At the university level, students in most arts and humanities programs receive academic credit for music courses such as music history, typically of Western art music, or music appreciation, which focuses on listening and learning about different musical styles. In addition, most North American and European universities offer music ensembles – such as choir, concert band, marching band, or orchestra – that are open to students from various fields of study. Most universities also offer degree programs in music education, certifying students as primary and secondary music educators. Advanced degrees such as the D.M.A. or the Ph.D can lead to university employment. These degrees are awarded upon completion of music theory, music history, technique classes, private instruction with a specific instrument, ensemble participation, and in depth observations of experienced educators. Music education departments in North American and European universities also support interdisciplinary research in such areas as music psychology, music education historiography, educational ethnomusicology, sociomusicology, and philosophy of education. The study of western art music is increasingly common in music education outside of North America and Europe, including Asian nations such as South Korea, Japan, and China. At the same time, Western universities and colleges are widening their curriculum to include music of outside the Western art music canon, including music of West Africa, of Indonesia (e.g. Gamelan music), Mexico (e.g., mariachi music), Zimbabwe (marimba music), as well as popular music. Music education also takes place in individualized, lifelong learning, and in community contexts. Both amateur and professional musicians typically take music lessons, short private sessions with an individual teacher. While instructional strategies are determined by the music teacher and the music curriculum in his or her area, many teachers rely heavily on one of many instructional methodologies that emerged in recent generations and developed rapidly during the latter half of the 20th Century. The Dalcroze method was developed in the early 20th century by Swiss musician and educator Émile Jaques-Dalcroze. The method is divided into three fundamental concepts − the use of solfège, improvisation, and eurhythmics. Sometimes referred to as "rhythmic gymnastics," eurhythmics teaches concepts of rhythm, structure, and musical expression using movement, and is the concept for which Dalcroze is best known. It focuses on allowing the student to gain physical awareness and experience of music through training that engages all of the senses, particularly kinesthetic. According to the Dalcroze method, music is the fundamental language of the human brain and therefore deeply connected to who we are. American proponents of the Dalcroze method include Ruth Alperson, Ann Farber, Herb Henke, Virginia Mead, Lisa Parker, Martha Sanchez, and Julia Schnebly-Black. Many active teachers of Dalcroze method were trained by Dr. Hilda Schuster who was one of the students of Dalcroze. Zoltán Kodály (1882–1967) was a prominent Hungarian music educator and composer who stressed the benefits of physical instruction and response to music. Although not really an educational method, his teachings reside within a fun, educational framework built on a solid grasp of basic music theory and music notation in various verbal and written forms. Kodály's primary goal was to instill a lifelong love of music in his students and felt that it was the duty of the child's school to provide this vital element of education. 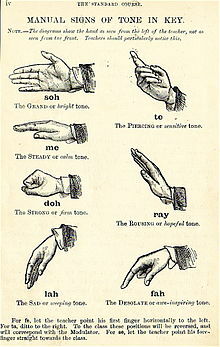 Some of Kodály's trademark teaching methods include the use of solfège hand signs, musical shorthand notation (stick notation), and rhythm solmization (verbalization). Most countries have used their own folk music traditions to construct their own instruction sequence, but the United States primarily uses the Hungarian sequence. The work of Denise Bacon, Katinka S. Daniel, John Feierabend, Jean Sinor, Jill Trinka, and others brought Kodaly's ideas to the forefront of music education in the United States. Carl Orff was a prominent German composer. Orff Schulwerk is considered an "approach" to music education. It begins with a student's innate abilities to engage in rudimentary forms of music, using basic rhythms and melodies. Orff considers the whole body a percussive instrument and students are led to develop their music abilities in a way that parallels the development of western music. The approach fosters student self-discovery, encourages improvisation, and discourages adult pressures and mechanical drill. 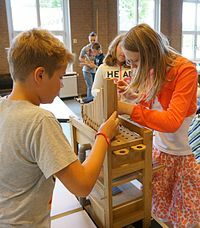 Carl Orff developed a special group of instruments, including modifications of the glockenspiel, xylophone, metallophone, drum, and other percussion instruments to accommodate the requirements of the Schulwerk courses. Experts in shaping an American-style Orff approach include Jane Frazee, Arvida Steen, and Judith Thomas. The Suzuki method was developed by Shinichi Suzuki in Japan shortly after World War II, and uses music education to enrich the lives and moral character of its students. The movement rests on the double premise that "all children can be well educated" in music, and that learning to play music at a high level also involves learning certain character traits or virtues which make a person's soul more beautiful. The primary method for achieving this is centered around creating the same environment for learning music that a person has for learning their native language. This 'ideal' environment includes love, high-quality examples, praise, rote training and repetition, and a time-table set by the student's developmental readiness for learning a particular technique. While the Suzuki Method is quite popular internationally, within Japan its influence is less significant than the Yamaha Method, founded by Genichi Kawakami in association with the Yamaha Music Foundation. Edwin Gordon's Music Learning Theory is based on an extensive body of research and field testing by Edwin E. Gordon and others in the larger field of Music Learning Theory. It provides music teachers with a comprehensive framework for teaching musicianship through audiation, Gordon's term for hearing music in the mind with understanding and comprehension when the sound is not physically present. The sequence of instructions is Discrimination Learning and Inference Learning. Discrimination Learning, the ability to determine whether two elements are the same or not the same using aural/oral, verbal association, partial synthesis, symbolic association, and composite synthesis. Inference Learning, students take an active role in their own education and learn to identify, create, and improvise unfamiliar patterns. The skills and content sequences within the Audiation theory help music teachers establish sequential curricular objectives in accord with their own teaching styles and beliefs. There also is a Learning Theory for Newborns and Young Children in which the Types and Stages of Preparatory Audiation are outlined. The growth of cultural diversity within school-age populations prompted music educators from the 1960s onward to diversify the music curriculum, and to work with ethnomusicologists and artist-musicians to establish instructional practices rooted in musical traditions. 'World music pedagogy' was coined by Patricia Shehan Campbell to describe world music content and practice in elementary and secondary school music programs. Pioneers of the movement, especially Barbara Reeder Lundquist, William M. Anderson, and Will Schmid, influenced a second generation of music educators (including J. Bryan Burton, Mary Goetze, Ellen McCullough-Brabson, and Mary Shamrock) to design and deliver curricular models to music teachers of various levels and specializations. The pedagogy advocates the use of human resources, i.e., "culture-bearers," as well as deep and continued listening to archived resources such as those of Smithsonian Folkways Recordings. Influenced by both the Kodály method and Gordon's Music Learning Theory, Conversational Solfège was developed by Dr. John M. Feierabend, former chair of music education at the Hartt School, University of Hartford. The program begins by immersing students in the musical literature of their own culture, in this case American. Music is seen as separate from, and more fundamental than, notation. In twelve learning stages, students move from hearing and singing music to decoding and then creating music using spoken syllables and then standard written notation. Rather than implementing the Kodály method directly, this method follows Kodály's original instructions and builds on America's own folk songs instead of on Hungarian folk songs. This early-childhood approach, sometimes referred to as the Sensory-Motor Approach to Music, was developed by the violinist Madeleine Carabo-Cone. This approach involves using props, costumes, and toys for children to learn basic musical concepts of staff, note duration, and the piano keyboard. The concrete environment of the specially planned classroom allows the child to learn the fundamentals of music by exploring through touch. 'Popular music pedagogy' — alternatively called rock music pedagogy, modern band, popular music education, or rock music education — is a recent development in music education consisting of the systematic teaching and learning of rock music and other forms of popular music both inside and outside formal classroom settings. Popular music pedagogy tends to emphasize group improvisation, and is more commonly associated with community music activities than fully institutionalized school music ensembles. The Manhattanville Music Curriculum Project was developed in 1965 as a response to declining student interest in school music. This creative approach aims to shape attitudes, helping students see music not as static content to be mastered, but as personal, current, and evolving. Rather than imparting factual knowledge, this method centers around the student, who learns through investigation, experimentation, and discovery. The teacher gives a group of students a specific problem to solve together and allows freedom to create, perform, improvise, conduct, research, and investigate different facets of music in a spiral curriculum. MMCP is viewed as the forerunner to projects in creative music composition and improvisation activities in schools. After the preaching of Reverend Thomas Symmes, the first singing school was created in 1717 in Boston for the purposes of improving singing and music reading in the church. These singing schools gradually spread throughout the colonies. Music education continued to flourish with the creation of the Academy of Music in Boston. Reverend John Tufts published An Introduction to the Singing of Psalm Tunes Using Non-Traditional Notation which is regarded as the first music textbook in the colonies. Between 1700 and 1820, more than 375 tune books would be published by such authors as Samuel Holyoke, Francis Hopkinson, William Billings, and Oliver Holden. Music began to spread as a curricular subject into other school districts. Soon after music expanded to all grade levels and the teaching of music reading was improved until the music curriculum grew to include several activities in addition to music reading. By the end of 1864 public school music had spread throughout the country. In 1832, Lowell Mason and George Webb formed the Boston Academy of Music with the purposes of teaching singing and theory as well as methods of teaching music. Mason published his Manuel of Instruction in 1834 which was based upon the music education works of Pestalozzian System of Education founded by Swiss educator Johann Heinrich Pestalozzi. This handbook gradually became used by many singing school teachers. From 1837–1838, the Boston School Committee allowed Lowell Mason to teach music in the Hawes School as a demonstration. This is regarded as the first time music education was introduced to public schools in the United States. In 1838 the Boston School Committee approved the inclusion of music in the curriculum and Lowell Mason became the first recognized supervisor of elementary music. In later years Luther Whiting Mason became the Supervisor of Music in Boston and spread music education into all levels of public education (grammar, primary, and high school). During the middle of the 19th century, Boston became the model to which many other cities across the United States included and shaped their public school music education programs. Music methodology for teachers as a course was first introduced in the Normal School in Potsdam. The concept of classroom teachers in a school that taught music under the direction of a music supervisor was the standard model for public school music education during this century. (See also: Music education in the United States) While women were discouraged from composing in the 19th century, "later, it was accepted that women would have a role in music education, and they became involved in this field...to such a degree that women dominated music education during the later half of the 19th century and well into the 20th century." Founding of the Music Supervisor's National Conference (changed to Music Educators National Conference in 1934, later MENC: The National Association for Music Education in 1998, and currently The National Association for Music Education – NAfME) in Keokuk, Iowa in 1907. Rise of the school band and orchestra movement leading to performance oriented school music programs. Growth in music methods publications. Frances Elliot Clark develops and promotes phonograph record libraries for school use. Carl Seashore and his Measures of Musical Talent music aptitude test starts testing people in music. 1950 The Child's Bill of Rights in Music A student-centered philosophy was formally espoused by MENC. 1953 The American School Band Directors Association formed The band movement becomes organized. 1957 Launch of Sputnik Increased curricular focus on science, math, technology with less emphasis on music education. 1959 Contemporary Music Project The purpose of the project was to make contemporary music relevant in children by placing quality composers and performers in the learning environment. Leads to the Comprehensive Musicianship movement. 1961 American Choral Directors Association formed The choral movement becomes organized. 1963 Yale Seminar Federally supported development of arts education focusing on quality music classroom literature. Juilliard Project leads to the compilation and publication of musical works from major historical eras for elementary and secondary schools. 1965 National Endowment for the Arts Federal financial support and recognition of the value music has in society. 1967 Tanglewood Symposium Establishment of a unified and eclectic philosophy of music education. Specific emphasis on youth music, special education music, urban music, and electronic music. 1969 GO Project 35 Objectives listed by MENC for quality music education programs in public schools. Published and recommended for music educators to follow. 1978 The Ann Arbor Symposium Emphasized the impact of learning theory in music education in the areas of: auditory perception, motor learning, child development, cognitive skills, memory processing, affect, and motivation. 1984 Becoming Human Through Music symposium "The Wesleyan Symposium on the Perspectives of Social Anthropology in the Teaching and Learning of Music" (Middletown, Connecticut, August 6–10, 1984). Emphasized the importance of cultural context in music education and the cultural implications of rapidly changing demographics in the United States. 1990 Multicultural Symposium in Music Education Growing out of the awareness of the increasing diversity of the American School population, the three-day Symposium for music teachers was co-sponsored by MENC, the Society for Ethnomusicology, and the Smithsonian Institution, in order to provide models, materials, and methods for teaching music of the world's cultures to school children and youth. 1994 National Standards for Music Education For much of the 1980s, there was a call for educational reform and accountability in all curricular subjects. This led to the National Standards for Music Education introduced by MENC. The MENC standards were adopted by some states, while other states have produced their own standards or largely eschewed the standards movement. 1999 The Housewright Symposium / Vision 2020 Examined changing philosophies and practices and predicted how American music education will (or should) look in the year 2020. 2007 Tanglewood II: Charting the Future Reflected on the 40 years of change in music education since the first Tanglewood Symposium of 1967, developing a declaration regarding priorities for the next forty years. 2014 Revised National Standards for Music Education The National Standards created in 1994 were revised with an emphasis on musical literacy. Instead of the 9 content standards, there are 4 artistic processes (Create, Perform, Respond and Connect) with 2–3 anchor standards per process. Music course offerings and even entire degree programs in online music education developed in the first decade of the 21st century at various institutions, and the fields of world music pedagogy and popular music pedagogy have also seen notable expansion. In the late 20th and early 21st centuries, social aspects of teaching and learning music came to the fore. This emerged as praxial music education, critical theory, and feminist theory. Of importance are the colloquia and journals of the MayDay Group, "an international think tank of music educators that aims to identify, critique, and change taken-for-granted patterns of professional activity, polemical approaches to method and philosophy, and educational politics and public pressures that threaten effective practice and critical communication in music education." With a new focus on social aspects of music education, scholars have analyzed critical aspects such as music and race, gender, class, institutional belonging, and sustainability. Institutional music education was started in colonial India by Rabindranath Tagore after he founded the Visva-Bharati University. At present, most universities have a faculty of music with some universities specially dedicated to fine arts such as Indira Kala Sangeet University, Swathi Thirunal College of Music or Rabindra Bharati University.Indian classical music is based on the Guru-Shishya parampara system. The teacher, known as Guru, transmit the musical knowledge to the student, or shyshya. This is still the main system used in India to transmit musical knowledge. Although European art music became popularized in schools throughout much of the world during the twentieth century (East Asia, Latin America, Oceania, Africa), India remains one of the few highly populated nations in which non-European indigenous music traditions have consistently received relatively greater emphasis. That said, there is certainly much western influence in the popular music associated with Bollywood film scores. The Indonesian island of Java is known for its rich musical culture, centered around gamelan music. The two oldest gamelan instrument sets, dating from the twelfth century, are housed in the kratons (palaces) in the cities of Yogyakarta and Surakarta. Gamelan music is and integral part of the Javanese culture: it is a part of religious ceremonies, weddings, funerals, palace activities, national holidays, and local community gatherings. In recent years, there has been an increasing market for gamelan associated tourism: several companies arrange visits for tourists wishing to participate in and learn gamelan. Gamelan music has a distinct pedagogical approach. The term maguru panggul, translated means “teaching with the mallet” describes the master-apprentice approach that is used most often when teaching the music. The teacher demonstrates long passages of music at a time, without stopping to have the student demonstrate comprehension of the passage, as in a western music pedagogy. A teacher and student will frequently sit on opposite sides of a drum or mallet instrument, so that both can play it. This provides the teacher an easy way to demonstrate, and the student can study and mimic the teacher's actions. The teacher trains the kendang player, who is the leader of the ensemble. The teacher works one on one with them and repeats the parts as many times as necessary until the piece is rhythmically and stylistically accurate. The Kendang player is sometimes relied on to transmit the music to their fellow gamelan members. The South African Department of Education and the ILAM Music Heritage Project SA teach African music using western musical framework. ILAM's Listen and Learn for students 11–14 is "unique" in teaching curriculum requirements for western music using recordings of traditional African music. From the time that Africa was colonized up to 1994, indigenous music and arts being taught in schools was a rare occurrence. The African National Congress (ANC) attempted to repair the neglect of indigenous knowledge and the overwhelming emphasis on written musical literacy in schools. It is not well known that the learning of indigenous music actually has a philosophy and teaching procedure that is different from western “formal” training. It involves the whole community because indigenous songs are about the history of its people. After the colonization of Africa, music became more centered on Christian beliefs and European folk songs, rather than the more improvised and fluid indigenous music. Before the major changes education went through from 1994 to 2004, during the first decade of the democratic government, teachers were trained as classroom teachers and told that they would have to incorporate music into other subject areas. The few colleges with teaching programs that included instrumental programs held a greater emphasis on music theory, history of western music, western music notation, and less on making music. Up until 1999, most college syllabi did not include training in indigenous South African Music. In African cultures music is seen as a community experience and is used for social and religious occasions. As soon as children show some sign of being able to handle music or a musical instrument they are allowed to participate with the adults of the community in musical events. Traditional songs are more important to many people because they are stories about the histories of the indigenous peoples. Among the Aztecs, Mayans, and Incas, music was used in ceremonies and rituals to teach the history of their civilizations and was also used for worship. The Aztec people were mainly educated by their priests. Music remained an important way to teach religion and history and was taught by priests for many centuries. When Spain and Portugal colonized parts of South America, music started to be influenced by European ideas and qualities. Several priests of European descent, such as Antonio Sepp, taught European systems of music notation and theory based on their knowledge of playing instruments throughout the 1700-1800s. Since music was taught to the general public by rote, very few knew how to read music other than those who played instruments until the nineteenth and twentieth centuries. The development of music in South America mainly followed that of European development. Choirs were formed to sing masses, chants, psalms, but secular music also became more prevalent in the seventeenth and eighteenth centuries and beyond. Music education in Latin America today has large emphasis on folk music, masses, and orchestral music. Many classrooms teach their choirs to sing in their native language as well as in English. Several Latin American Schools, specifically in Puerto Rico and Haiti, believe music to be an important subject and are working on expanding their programs. Outside of school, many communities form their own musical groups and organizations. Community performances are very popular with the local audiences. There are a few well-known Latin American choral groups, such as "El Coro de Madrigalistas" from Mexico. This famous choral group tours around Mexico, showing students around the country what a professional choral ensemble sounds like. The music, languages, and sounds we are exposed to within our own cultures determine our tastes in music and affect the way we perceive the music of other cultures. Many studies have shown distinct differences in the preferences and abilities of musicians from around the world. One study attempted to view the distinctions between the musical preferences of English and Japanese speakers, providing both groups of people with the same series of tones and rhythms. The same type of study was done for English and French speakers. Both studies suggested that the language spoken by the listener determined which groupings of tones and rhythms were more appealing, based on the inflections and natural rhythm groupings of their language. Another study had Europeans and Africans try to tap along with certain rhythms. European rhythms are regular and built on simple ratios, while African rhythms are typically based on irregular ratios. While both groups of people could perform the rhythms with European qualities, the European group struggled with the African rhythms. This has to do with the ubiquity of complex polyrhythm in African culture and their familiarity with this type of sound. While each culture has its own musical qualities and appeals, incorporating cross-cultural curricula in our music classrooms can help teach students how to better perceive music from other cultures. Studies show that learning to sing folk songs or popular music of other cultures is an effective way to understand a culture as opposed to merely learning about it. If music classrooms discuss the musical qualities and incorporate styles from other cultures, such as the Brazilian roots of the Bossa Nova, the Afro-Cuban clave, and African drumming, it will expose students to new sounds and teach them how to compare their cultures’ music to the different music and start to make them more comfortable with exploring sounds. Many states and school districts have adopted their own standards for music education. Some schools and organizations promote integration of arts classes, such as music, with other subjects, such as math, science, or English, believing that integrating the different curricula will help each subject to build off of one another, enhancing the overall quality of education. One example is the Kennedy Center's "Changing Education Through the Arts" program. CETA defines arts integration as finding a natural connection(s) between one or more art forms (dance, drama/theater, music, visual arts, storytelling, puppetry, and/or creative writing) and one or more other curricular areas (science, social studies, English language arts, mathematics, and others) in order to teach and assess objectives in both the art form and the other subject area. This allows a simultaneous focus on creating, performing, and/or responding to the arts while still addressing content in other subject areas. The European Union Lifelong Learning Programme 2007–2013 has funded three projects that use music to support language learning. Lullabies of Europe (for pre-school and early learners), FolkDC (for primary), and the recent PopuLLar (for secondary). In addition, the ARTinED project is also using music for all subject areas. A number of researchers and music education advocates have argued that studying music enhances academic achievement, such as William Earhart, former president of the Music Educators National Conference, who claimed that "Music enhances knowledge in the areas of mathematics, science, geography, history, foreign language, physical education, and vocational training." Researchers at the University of Wisconsin suggested that students with piano or keyboard experience performed 34% higher on tests that measure spatial-temporal lobe activity, which is the part of the brain that is used when doing mathematics, science, and engineering. An experiment by Wanda T. Wallace setting text to melody suggested that some music may aid in text recall. She created a three verse song with a non-repetitive melody; each verse with different music. A second experiment created a three verse song with a repetitive melody; each verse had exactly the same music. A third experiment studied text recall without music. She found the repetitive music produced the highest amount of text recall, suggesting music can serve as a mnemonic device. Smith (1985) studied background music with word lists. One experiment involved memorizing a word list with background music; participants recalled the words 48 hours later. Another experiment involved memorizing a word list with no background music; participants also recalled the words 48 hours later. Participants who memorized word lists with background music recalled more words demonstrating music provides contextual cues. Citing studies that support music education's involvement in intellectual development and academic achievement, the United States Congress passed a resolution declaring that: "Music education enhances intellectual development and enriches the academic environment for children of all ages; and Music educators greatly contribute to the artistic, intellectual and social development of American children and play a key role in helping children to succeed in school." Bobbett (1990) suggests that most public school music programs have not changed since their inception at the turn of the last century. "…the educational climate is not conducive to their continuance as historically conceived and the social needs and habits of people require a completely different kind of band program." A 2011 study conducted by Kathleen M. Kerstetter for the Journal of Band Research found that increased non-musical graduation requirements, block scheduling, increased number of non-traditional programs such as magnet schools, and the testing emphases created by the No Child Left Behind Act are only some of the concerns facing music educators. Both teachers and students are under increased time restrictions"
Dr. Patricia Powers states, "It is not unusual to see program cuts in the area of music and arts when economic issues surface. It is indeed unfortunate to lose support in this area especially since music and the art programs contribute to society in many positive ways." Comprehensive music education programs average $187 per pupil, according to a 2011 study funded by the national Association of Music Merchants (NAMM) Foundation The Texas Commission on Drugs and Alcohol Abuse Report noted that students who participated in band or orchestra reported the lowest lifetime and current use of all substances including alcohol, tobacco, and illicit drugs. Studies have shown that music education can be used to enhance cognitive achievement in students. In the United States an estimated 30% of students struggle with reading, while 17% are reported as having a specific learning disability linked to reading. Using intensive music curriculum as an intervention paired alongside regular classroom activities, research shows that students involved with the music curriculum show increases in reading comprehension, word knowledge, vocabulary recall, and word decoding. When a student is singing a melody with text, they are using multiple areas of their brain to multitask. Music effects language development, increases IQ, spatial-temporal skills, and improves test scores. Music education has also shown to improve the skills of dyslexic children in similar areas as mentioned earlier by focusing on visual auditory and fine motor skills as strategies to combat their disability. Since research in this area is sparse, we cannot convincingly conclude these findings to be true, however the results from research done do show a positive impact on both students with learning difficulties and those who are not diagnosed. Further research will need to be done, but the positive engaging way of bringing music into the classroom cannot be forgotten, and the students generally show a positive reaction to this form of instruction. Music education has also been noted to have the ability to increase someones overall IQ, especially in children during peak development years. Spacial ability, verbal memory, reading and mathematic ability are seen to be increased alongside music education (primarily through the learning of an instrument). Researchers also note that a correlation between general attendance and IQ increases is evident, and due to students involvement in music education, general attendance rates increase along with their IQ. Fine motor skills, social behaviours, and emotional well being can also be increased through music and music education. The learning of an instrument increases fine motor skills in students with physical disabilities. Emotional well being can be increased as students find meaning in songs and connect them to their everyday life. Through social interactions of playing in groups like jazz and concert bands, students learn to socialize and this can be linked to emotional and mental well being. In some communities – and even entire national education systems – music is provided little support as an academic subject area, and music teachers feel that they must actively seek greater public endorsement for music education as a legitimate subject of study. This perceived need to change public opinion has resulted in the development of a variety of approaches commonly called "music advocacy". Music advocacy comes in many forms, some of which are based upon legitimate scholarly arguments and scientific findings, while other examples controversially rely on emotion, anecdotes, or unconvincing data. Recent high-profile music advocacy projects include the "Mozart Effect", the National Anthem Project, and the movement in World Music Pedagogy (also known as Cultural Diversity in Music Education) which seeks out means of equitable pedagogy across students regardless of their race, ethnicity, or socioeconomic circumstance. The Mozart effect is particularly controversial as while the initial study suggested listening to Mozart positively impacts spatial-temporal reasoning, later studies either failed to replicate the results, suggested no effect on IQ or spatial ability, or suggested the music of Mozart could be substituted for any music children enjoy in a term called "enjoyment arousal." Another study suggested that even if listening to Mozart may temporarily enhance a student's spatial-temporal abilities, learning to play an instrument is much more likely to improve student performance and achievement. Educators similarly criticized the National Anthem Project not only for promoting the educational use of music as a tool for non-musical goals, but also for its links to nationalism and militarism. Contemporary music scholars assert that effective music advocacy uses empirically sound arguments that transcend political motivations and personal agendas. Music education philosophers such as Bennett Reimer, Estelle Jorgensen, David J. Elliott, John Paynter, and Keith Swanwick support this view, yet many music teachers and music organizations and schools do not apply this line of reasoning into their music advocacy arguments. Researchers such as Ellen Winner conclude that arts advocates have made bogus claims to the detriment of defending the study of music, her research debunking claims that music education improves math, for example. Researchers Glenn Schellenberg and Eugenia Costa-Giomi also criticize advocates incorrectly associating correlation with causation, Giomi pointing out that while there is a "strong relationship between music participation and academic achievement, the causal nature of the relationship is questionable." Philosophers David Elliott and Marissa Silverman suggest that more effective advocacy involves shying away from "dumbing down" values and aims through slogans and misleading data, energy being better focused into engaging potential supporters in active music-making and musical-affective experiences, these actions recognizing that music and music-making are inherent to human culture and behavior, distinguishing humans from other species. 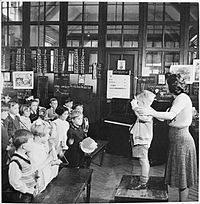 Despite the limitations imposed on women's roles in music education in the 19th century, women were accepted as kindergarten teachers, because this was deemed to be a "private sphere". Women also taught music privately, in girl's schools, Sunday schools, and they trained musicians in school music programs. By the turn of the 20th century, women began to be employed as music supervisors in elementary schools, teachers in normal schools and professors of music in universities. Women also became more active in professional organizations in music education, and women presented papers at conferences. A woman, Frances Clarke (1860-1958) founded the Music Supervisors National Conference in 1907. While a small number of women served as President of the Music Supervisors National Conference (and the following renamed versions of the organization over the next century) in the early 20th century, there were only two female Presidents between 1952 and 1992, which "[p]ossibly reflects discrimination." After 1990, however, leadership roles for women in the organization opened up. From 1990 to 2010, there were five female Presidents of this organization. Women music educators "outnumber men two-to-one" in teaching general music, choir, private lessons, and keyboard instruction . More men tend to be hired as for band education, administration and jazz jobs, and more men work in colleges and universities. According to Dr. Sandra Wieland Howe, there is still a "glass ceiling" for women in music education careers, as there is "stigma" associated with women in leadership positions and "men outnumber women as administrators." ^ a b Madeleine, Carabo-Cone (30 November 1968). "A Sensory-Motor Approach to Music Learning. Book I - Primary Concepts". ed.gov. Retrieved 15 April 2018. ^ Oaklander, Violet. (2006) Hidden Treasure : A Map to the Child's Inner Self. London, Karnac Books. ^ Randel, D. (Ed.) (1986). Education in the United States. In The New Harvard Dictionary of Music (pp. 276–278). London/Cambridge, MA: Belknap Press of Harvard University Press. ^ Christopher Azzara, Audiation, Improvisation, and Music Learning Theory. 1991, The Quarterly, 2(1–2), 106–109. ^ Roberts, Willie J. "Gordon's Music Learning on Piano". PI21. Owensboro. Retrieved 23 February 2018. ^ Higgins, Lee and Campbell, Patricia Shehan, Free to be Musical: Group Improvisation in Music (Rowman & Littlefield Education, 2010). ^ Higgins, Lee, Community Music: In Theory and in Practice (Oxford University Press, 2012). ^ "Music School Founder Tried to 'Brainwash' Students." Times of India. April 1. 2005. ^ "SC Jails Elusive Boss School Women for 15 Days", Zee News India. March 14, 2012. ^ a b c "Women Composers In American Popular Song, Page 1". parlorsongs.com. Retrieved 15 April 2018. ^ "Tanglewood II - Charting the Future". www.bu.edu. Retrieved 15 April 2018. ^ Gould, Elizabeth (2007). "Feminist theory in music education research: grrl‐illa games as nomadic practice (or how music education fell from grace)". Music Education Research. 6: 67–79. doi:10.1080/1461380032000182849. ^ "About the MayDay Group – Mayday Group". www.maydaygroup.org. Retrieved 15 April 2018. ^ Bates, Vincent C (2012). "Social Class and School Music". Music Educators Journal. 98 (4): 33–37. doi:10.1177/0027432112442944. ^ Lindsay, Jennifer (1979). Javanese Gamelan. London: Oxford University Press. ISBN 978-0-19-580413-3. ^ Bakan, Michael B. (1999). Music of Death and New Creation. Chicago: University of Chicago Press. ISBN 978-0-226-03488-1. ^ Herbst, Anri; de Wet, Jacques; Rijsdijk, Susan (2005). "A Survey of Music Education in the Primary Schools of South Africa's Cape Peninsula". Journal of Research in Music Education. 53 (3): 260–283. doi:10.2307/3598684. JSTOR 3598684. ^ Nketia, J. H. Kwabena (1970). "Music Education in Africa and the West: We Can Learn from Each Other". Music Educators Journal. 57 (3): 48–55. doi:10.2307/3392906. JSTOR 3392906. ^ De Couve, Alicia C.; Pino, Claudia Dal; Frega, Ana Lucía (1997). "An Approach to the History of Music Education in Latin America". The Bulletin of Historical Research in Music Education. 19 (1): 10–39. doi:10.1177/153660069701900102. JSTOR 40214944. ^ Lawler, Vanett (1945). "Music Education in Fourteen Latin-American Republics". Music Educators Journal. 31 (4): 20–30. doi:10.2307/3386758. JSTOR 3386758. ^ a b Bicknell, Jeanette. "Cross-Cultural Research and the Nature of Music". Psychology Today. ^ Ilari, Beatriz; Chen-Hafteck, Lily; Crawford, Lisa (1 May 2013). "Singing and cultural understanding: A music education perspective". International Journal of Music Education. 31 (2): 202–216. doi:10.1177/0255761413487281. ^ "home". folkdc.eu. 11 February 2011. Retrieved 15 April 2018. ^ "PopuLLar - Music and Language Learning". www.facebook.com. Retrieved 15 April 2018. ^ "ARTinED - A new approach to education using the arts". www.artined.eu. Archived from the original on 4 November 2013. Retrieved 15 April 2018. ^ a b Morrison, Steven J (1994). "Music students and academic growth". Music Educators Journal. 81 (2): 33–36. doi:10.2307/3398812. JSTOR 3398812. ^ Rauscher, F.; Zupan, M.A. (2000). "Classroom Keyboard Instruction Improves Kindergarten Children's Spatial-Temporal Performance: A Field Experiment". Early Childhood Research Quarterly. 15 (2): 215–228. doi:10.1016/s0885-2006(00)00050-8. ^ a b Wallace, W (1994). "Memory for music: Effect of melody on recall of text". Journal of Experimental Psychology: Learning, Memory, and Cognition. 20 (6): 1471–1485. doi:10.1037/0278-7393.20.6.1471. ^ Smith, S (1985). "Background music and context-dependent memory". American Journal of Psychology. 98 (4): 591–603. doi:10.2307/1422512. JSTOR 1422512. ^ Bobbett, G. C. (1990). Rural Appalachian Band Directors' Academic Preparation: Musical Preparation, Facilities, Monetary Resources, and Methods of Student Evaluation, and Their Students' Musical Independence. [S.l. ]: Distributed by ERIC Clearinghouse. ^ Kerstetter, Kathleen M (2011). "Investigating High School Band Recruitment Procedures Using Educational Marketing Principles". Journal of Band Research. 46 (2): 1–17. ^ Fermanich, M. L. (2011). "Money for music education: a district analysis of the how, what, and where of spending for music education". Journal of Education Finance. 37 (2): 130. ^ "Benefits of Music Education - How do students benefit from music?". childrensmusicworkshop.com. Retrieved 15 April 2018. ^ Register, D.; Darrow, A.A; Swedberd, O.; Standley, J. (2007). "The use of music to enhance reading skills of second grade students and students with reading disabilities". Journal of Music Therapy. 44 (1): 23–37. doi:10.1093/jmt/44.1.23. PMID 17419662. ^ Overy, K. (2000). Dyslexia, temporal processing and music: The potential of music as an early learning aid for dyslexic children. Psychology of Music 28(2). 218–229. ^ Butzlaff, R (2000). "Can music be used to teach reading?". The Journal of Aesthetic Education. 34 (3/4): 167–178. doi:10.2307/3333642. JSTOR 3333642. ^ a b Schellenberg, E.G. (2004). "Music lessons enhance IQ". Psychological Science. 15 (8): 511–514. CiteSeerX 10.1.1.152.4349. doi:10.1111/j.0956-7976.2004.00711.x. PMID 15270994. ^ Bosacki, S.; O'Neill, S. (2013). "Early adolescents' emotional perceptions and engagement with popular music activities in everyday life". International Journal of Adolescence and Youth. 20 (2): 228–244. doi:10.1080/02673843.2013.785438. ^ Chabris, Christopher F (1999). "Prelude or requiem for the 'Mozart effect'?". Nature. 400 (6747): 826–827. doi:10.1038/23608. PMID 10476958. ^ Steele, Kenneth M.; Bass, Karen E.; Crook, Melissa D. (1999). "The Mystery of the Mozart Effect: Failure to Replicate". Psychological Science. 10 (4): 366–369. doi:10.1111/1467-9280.00169. ^ Thompson, W.F. ; Schellenberg, E.G. ; Husain, G. (2001). "Mood, arousal, and the Mozart effect". Psychological Science. 12 (3): 248–251. doi:10.1111/1467-9280.00345. PMID 11437309. ^ Deborah Bradley, "Oh That Magic Feeling! Multicultural Human Subjectivity, Community, and Fascism's Footprints," Philosophy of Music Education Review, Vol. 17, No. 1 (2009): 56, 74. ^ a b c d bigbadbariguru (5 July 2012). "A historical view of women in music education careers". slideshare.net. Retrieved 15 April 2018. ^ "International Association for Jazz Education". iaje.org. Retrieved 15 April 2018. ^ Oy/ML, Medusaworks. "ISPME – Home". www2.siba.fi. Retrieved 15 April 2018. Ratey, John J., MD. A User's Guide to the Brain. New York: Pantheon Books, 2001. Rauscher, F.H., et al. "Music and Spatial Task Performance: A Causal Relationship," University of California, Irvine, 1994. Sorce Keller, Marcello (1984). "Music in Higher Education in Italy and in the United States: the Pros and Cons of Tradition and Innovation". Symposium. XXIV: 140–147. Sorce Keller, Marcello (1987). "Music Education in Italy: Something New on the Western Front". International Journal of Music Education. 10: 17–19. doi:10.1177/025576148701000103. Sorin-Avram, Vîrtop (2015). "The Musical Education: From Testing the Ground to General Culture Acquisition". Procedia - Social and Behavioral Sciences. 191: 2500–4. doi:10.1016/j.sbspro.2015.04.443. Weinberger, Norm. "The Impact of Arts on Learning." MuSICa Research Notes 7, no. 2 (Spring 200). Barrett, Margaret, 2010. A Cultural Psychology of Music Education. New York: Oxford University Press. Lundquist, Barbara R.; Sims, Winston T. (Autumn 1996). "African-American Music Education: Reflections on an Experience". Black Music Research Journal. 16 (2): 311–336. doi:10.2307/779334. ISSN 0276-3605. JSTOR 779334. McPherson, Gary (2006). The Child as Musician. New York: Oxford University Press. McPherson, Gary and Graham Welch (2012). The Oxford Handbook of Research in Music Education. New York: Oxford University Press. Mark, Michael L.; Gary, Charles L. (2007). A history of American music education (3 ed.). Rowman & Littlefield Education. ISBN 978-1-57886-523-9. Schafer, R. Murray (1965). The Composer in the Classroom. Toronto: B.M.I. Canada. 37 p.
Yarbrough, Cornelia (Winter 1984). "A Content Analysis of the "Journal of Research in Music Education", 1953-1983". Journal of Research in Music Education. 32 (4): 213–222. doi:10.2307/3344920. ISSN 0022-4294. JSTOR 3344920. This page was last edited on 13 April 2019, at 20:36 (UTC).